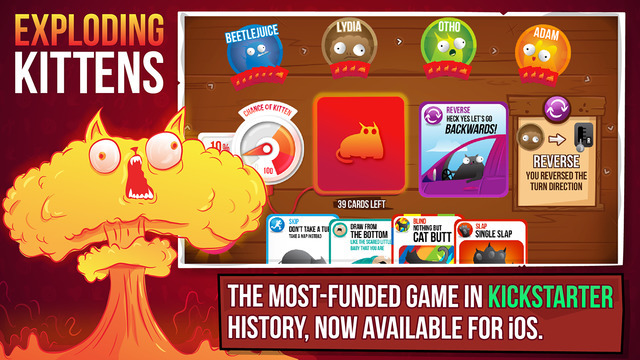 Exploding Kittens , the most successful crowd-funded card game from designers Elan Lee and Shane Small along with The Oatmeal’s creator Matthew Inman, has now been made digital! And that game is now readily available on the App Store. Not surprisingly reaching #1 on the top paid apps list the day it got released. 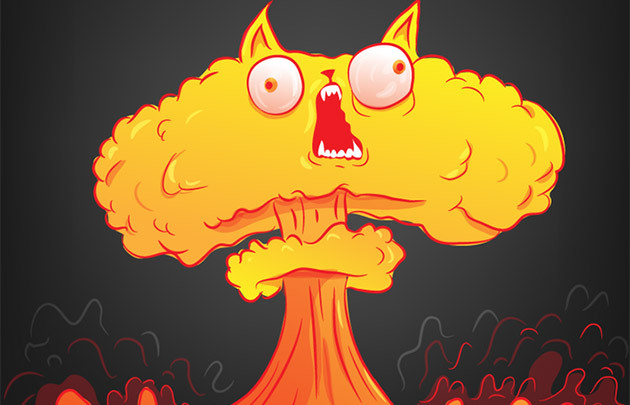 To those unfamiliar with the game, Exploding Kittens is a “take-that” style card game where players take turns drawing cards until someone draws an Exploding Kitten. As you might have guessed, it’s not a good thing since that card instantly eliminates you from the game. Luckily, most of the actions manipulate the game flow in such a way that cards can be moved, reshuffled, and in some cases, even avoided! The game ends when all but one player is eliminated. The app is in its early stages (like having no Android support…yet) and the developers have stated that “It’s not quite a cat yet. It’s still just a kitten.” meow. cheeky. 😉 hahaha. Having tried the application I noticed that they brought in some new cards that they say were exclusive to the digital version, although also removed some cards out like the “Nope cards” that is used to cancel out a player’s action. There are still a lot of tweaks to be done, so it seems. They did mention that they will incorporate the “nope” card in future updates. To those interested in getting the game, keep in mind that FOR NOW it only offers Bluetooth/WLAN multiplayer support; in other words, you and your friends need to have the app in your devices, and need to be in the same room for it to function. No single-player, pass-and-play or online feature for now but again, they said it will be included in the pipeline. To compensate for this, um, “inconvenience”, for a limited-time only all the in-app purchases (IAP) which includes new cards and avatars can be downloaded for free (until 12 midnight to be specific)! So we suggest taking advantage of this amazing offer! I’ve played the analog version and I would say it was a fun and light experience and, like all board and card games, this is an experience best laid out in a table. But to those people on the go and need a quick party-game fix with friends. 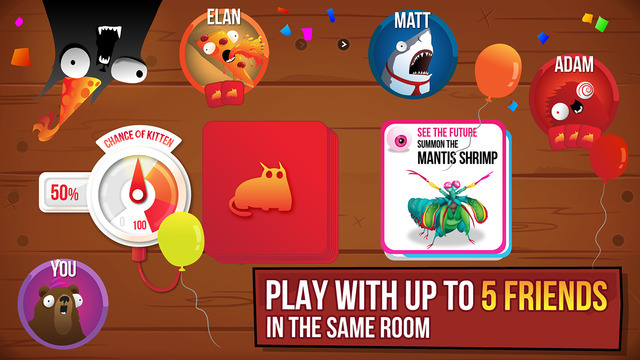 You can’t go wrong with Exploding Kittens! Next article17-Year Old Pinoy Makes Own BB-8! Elevates Geekery to new Heights!